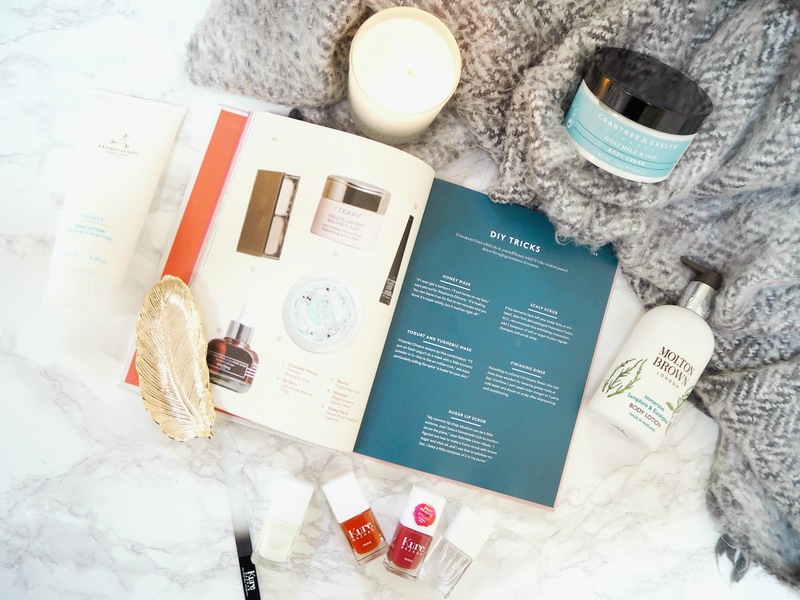 Last night the clocks went back and we're going to be truly into the Autumn/Winter months, so what better time to share my perfect relaxing routine for a good night's sleep? 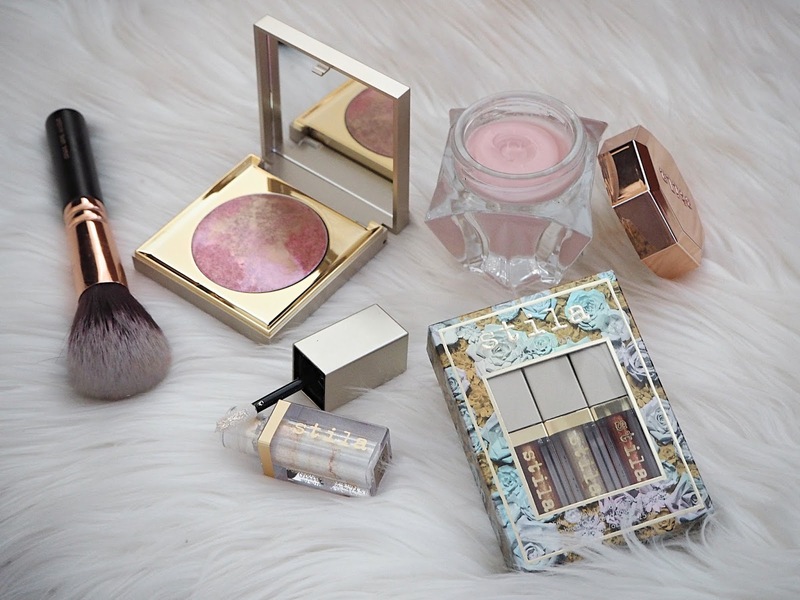 Make sure you also check out my Instagram giveaway to win some of the products featured here! I start any evening of relaxation by removing my makeup. 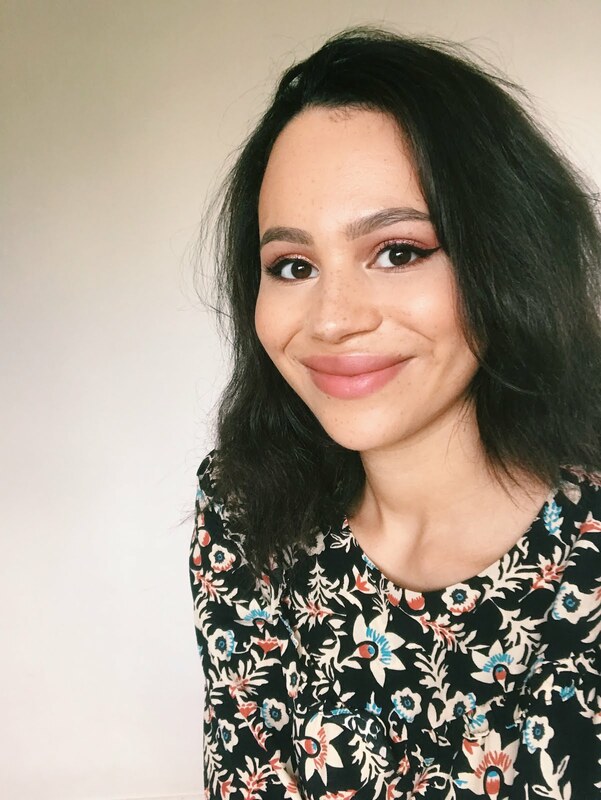 I don't want to go into too much detail with skincare because I recently shared My Sunday Facial Routine, however I've since tried some of Korres's facial skincare for the first time and I've been impressed! I tend to only wear quite light makeup on the weekends unless I'm doing something big so the Korres Olympus Tea 3 in 1 Cleansing Emulsion* | £15 | is perfect. This has a lightweight milky-cream texture and smells lovely. It's great when I don't want something oil-based and it effectively removes makeup (though probably isn't the best for heavy waterproof eyeliner and mascara) whilst being gentle and nourishing (without smothering the skin) with ingredients such as aloe vera. I then follow it up with the Korres Olympus Tea Cleansing Cream Foam* | £18. This is a gently foaming cream-based product for a second (or morning) cleanse. It leaves my skin feeling very clean but not tight or dry and is packed full of antioxidants. I'm a big lover of candles and there are a few that I've had on rotation for my relaxing nights in. The Aromatherapy Associates Relax Candle* | £38 | is just so beautiful! It's a soft, almost powdery (but not at all dated!) scent with bay and myrrh that really deos fill the room when I light it. 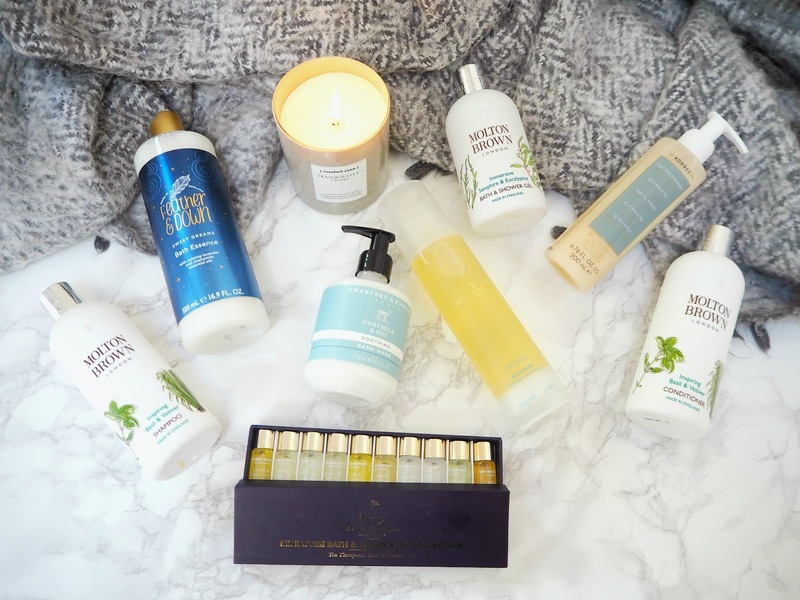 I can't believe I've already used half of it up... Another favourite is the Comfort Zone Tranquility Candle | £25 | which I picked up after visiting a spa and having a treatment using the body products from this range. It has a soft, warm scent that never fails to leave me feeling cosy and relaxed with cedar wood, sweet orange and floral notes. Finally, I've mentioned this brand a few times now as an affordable option for products that will help you drift off into a good night's sleep after my mum got me some of their products for my birthday. My next pick is the Feather and Down Calming Candle* | £18. Their products all have this beautiful, relaxing lavender and chamomile scent, meaning this is perfect to burn for an hour or two before bed, so the calming scent has filled the room by the time you go to sleep. Of course, any relaxing evening has to feature a nice soak in the bath whilst reading or letting a face mask sink in. There are two lovely options here from Feather and Down: the Sweet Dreams Sleep Salts* | £8 | & Sweet Dreams Bath Essence* | £7. The Salts are probably my favourite - you just put a scoop into your bath whilst you're running it and the warm, calming chamomile and lavender scent fills the entire room, making me instantly unwind. If you want something slightly creamier and more bubbly then I'd recommend the Essence - the scent isn't quite as enveloping but it's still lovely. I'm also enjoying the Aromatherapy Associates Miniature Bath & Shower Oil Collection* | £39. You only need a couple of drops of the oil in your bath for the fragrance to completely fill your bathroom, so these tiny bottles don't run out too quickly and it's a great way to try a bit of everything and decide which you want to invest in. There's everything in here from a menthol scent to clear your airways to reviving morning fragrances, however for a chilled-out evening in, I love Relax Light (with ylang ylang and petitgrain), De-Stress Mind (with frankincense, chamomile and petitgrain) and De-Stress Muscle (with black pepper, ginger and rosemary). I've also been using the Molton Brown Seabourn collection with Basil & Vetiver and Samphire & Eucalyptus*, though unfortunately it's no longer available! (Apparently their Coastal Cypress and Sea Fennel range is very similar though.) There's a gorgeous cleansing shampoo, a moisturising and detangling conditioner and also a shower gel and body lotion. I just love the clean, open, spa-like fragrance of this range. Another range I'm reaching for, especially as we head into winter, is Crabtree & Evelyn's Goatmilk & Oat* collection | £7.50-£31. I just love the fresh, natural, soft scent! The hand wash is great because it doesn't strip the skin (in fact it's nice and moisturising) which my hands definitely appreciate at this time of year. I'm also a big fan of the shower milk because it's foaming, smells amazing and leaves my skin so soft. However the highlight for me is the body cream, which I like to use after a bath for that 'smooth legs against your sheets' feeling. It has such a lightweight texture but instantly relieves dry, tight skin and gives lasting nourishment. I love how the scent lingers on the skin even hours after applying this! I've also been using the Aromatherapy Associates Revive Body Wash* | £27. It's very much a luxury indulgence but I love the packaging (it stops me wasting any product) and the scent is so unique. It contains grapefruit, peppermint and neroli essential oils and foams beautifully. The Aromatherapy Associates Revive Body Lotion* | £37 | is also gorgeous (though again, a bit of a splurge) - it has a very light, creamy texture however softens and plumps the skin. The fragrance is perfectly balanced; slightly floral, slightly herbal in a very smooth, soft way, containing rosemary, grapefruit and juniper. You can also just use this on your pulse-points as an aromatherapy product. I've bought Aromatherapy Associates products as gifts for people so often but hadn't actually tried them myself until now and I'm really impressed! Once I'm out of the bath, I like to relax by reading a book, painting my nails (something which I rarely have time for during the week!) and curling up with a mug of hot chocolate. 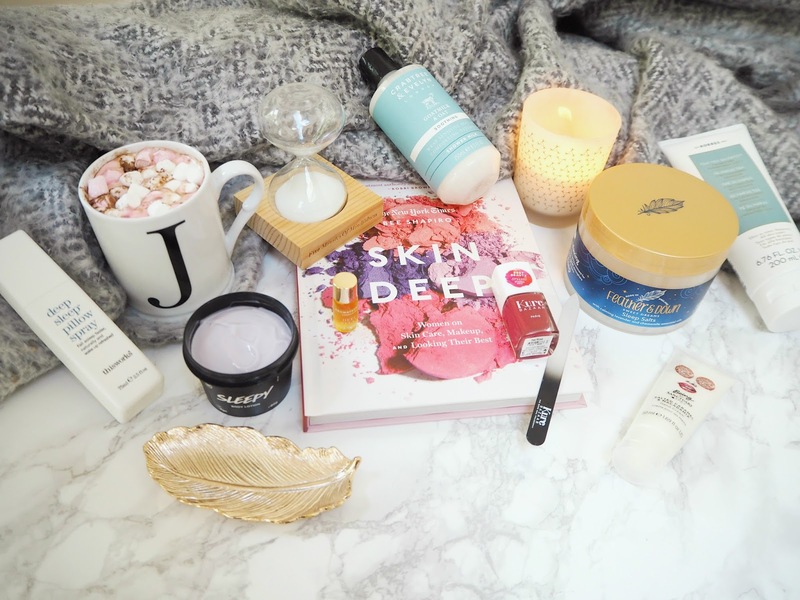 I'm going to do a full review on this once I've finished it, but if you're a beauty-lover then I can't recommend Skin Deep by Bee Shapiro* | £19.99 | enough. I love these kinds of coffee table books to read a few pages from when I get a minute. If I'm relaxing, I want something that's entertaining but that I can dip in and out of. If you're a fan of reading ITG's Top Shelf series or the books of Sali Hughes then I think you'll love this; it's all about famous women talking about their beauty routines, favourite products and perspectives on beauty, interspersed with tips and beauty information. I'm currently obsessed with the Whittard Peanut Butter Hot Chocolate | £7 | which really is as decadently yummy as it sounds! It's definitely a once-a-week treat for me, but it does brighten up my Sunday evening. In terms of my nail, I've been trying out a few products from Kure Bazaar recently. They have a really nice strengthening base coat - the Natural Finish First Base* | £15 | which dries really quickly (even on the weekends I'm pretty impatient about this!) There's also a Top Dry Finish* | £15 | which is nice, and does help set down my polish more quickly so it doesn't smudge or smear, though I don't think it beats my Seche Vite... The polishes themselves come in so many beautiful shades! I have two that are perfect for autumn - Tea Rose* & Bohemian* | £15 each. Tea rose is a gorgeous, rich pink shade with plummy undertones, whereas Bohemian is a sort of orange-red. I love how opaque these shades are (you could get away with a single coat if you wanted to) but I do wish they lasted a little longer before chipping on my (admittedly) weak nails. As an indulgent treat I love the BEING by Sanctuary Salted Caramel & Macadamia Hand Cream | £5. It's lovely and moisturising without leaving my hands greasy and the smell is just as yummy as it sounds! It's gorgeously warm and sweet - if you aren't into these kinds of 'foodie' fragrances, it might be a bit sickly for you, however I love them! Another favourite is the Lush Sleepy Body Lotion | £7.95 (95g). I actually don't really use this as a body lotion - I apply it to my inner wrists and neck or chest to get the aromatherapy benefits. It smells absolutely gorgeous! As well as calming lavender there are the warm, sweet, yummy notes of oatmeal, ylang ylang and tonka. The final step in my routine is to spritz my pillow with the This Works Deep Sleep Pillow Spray | £18. I was sceptical before I tried this but it really does make a difference! The calming blend of lavender and chamomile relaxes me and helps me drift off into a deep, lasting sleep. How do you relax and which products do you use? Don't forget to head over to my Instagram page for the giveaway with Feather & Down and check out their YouTube page for some sleep tips! The Sanctuary Salted Caramel & Macadamia Hand Cream souds like it would smell flipping incredible! I love scents like that! I keep hearing really good things about the sleep spray too that I am so up for trying it! Korres seems to be a great skincare brand, I should try out a couple of their products to change up my routine. The calming salts must be great to have a relaxing bath, I always go for Lush bath bombs usually but I should definitely try out lavender-scented products for a nice bath on a winter evening! A new Molton Brown store has just opened up in my town and I'm so excited to pick up some bits from there! I'm also loving Korres' new cleansers at the moment - they're so gentle. A candle, face mask and cup of tea are definitely a part of my relaxation routine! I really want to incorporate more baths into my Sunday relaxation, but I always end up running around, trying to get chores done! Lovely - definitely love a day of chilling out! I like the look of that deep sleep pillow spray! I love a relaxing night in! I've been dying to try some bits from the Feather & Down range, I'm swooning over their packaging!